This is the story of a non paying patient family from Dhenkanal district in Odisha. 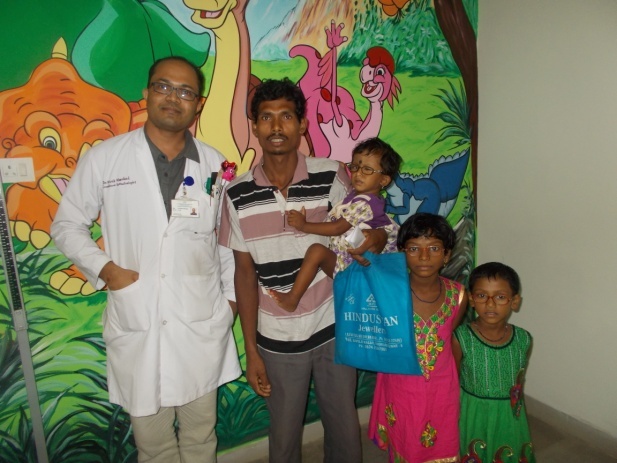 The parents of 3 girls - 10 year old Anusuya, 7 year old Anita and 3 year old Sunita who were all suffering from loss of vision since birth – brought their hopes with them when they travelled to LVPEI's Bhubaneswar campus upon being referred by a local ophthalmologist who they had consulted. Both the parents and their three daughters were examined by the Pediatric Ophthalmologist Dr Vivek Warkad and their case diagnosed as Familial Congenital Cataract. The parents were counseled regarding the importance of early eye check-up and the promise of better visual prognosis if surgery were to be performed early in the post natal period. All the three children underwent very meticulous surgery in their eyes over a period of 2 weeks. A month later, they were examined under general anesthesia and prescribed glasses. They have since been visiting regularly for routine postoperative checks and rehabilitation. The three children now have significantly improved vision, and Anusuya and Anita are able to go to school as normally as other children their age, while the youngest child Sunita plays around at home. The parents are very happy and thankful to LVPEI. The buoyed father too has now undergone cataract surgery and recovered some vision.